When we moved into this house, I had most of the main living areas painted. I also had the master bedroom (using that term very loosely) painted mainly because it needed a good coat of paint, badly. After seeing the estimate to have all the berooms painted, I scaled back the job. 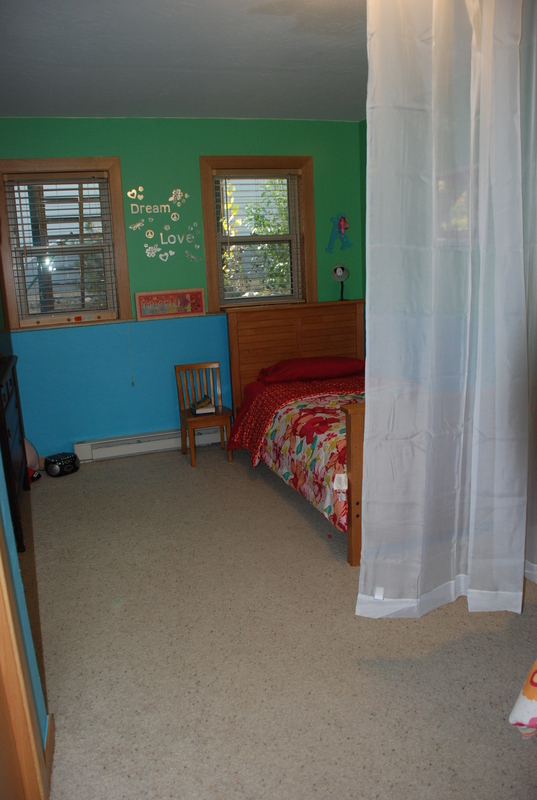 I knew that I could paint the kids rooms and basement. It took me a bit longer to get it done than I thought it would but now I have two rooms down and only one to go. Sam wanted silver metallic and neon green walls. 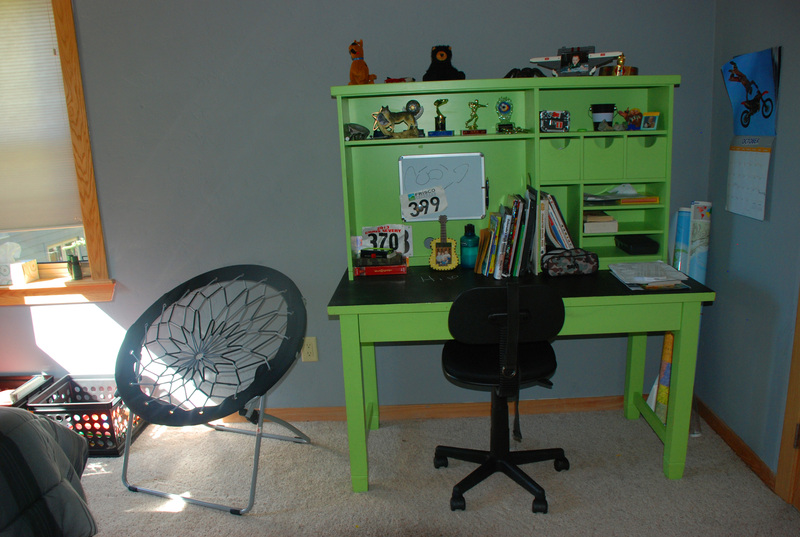 We compromised with a bright green desk, one neon accent wall and cement gray on the rest. He was thrilled when it was all done. 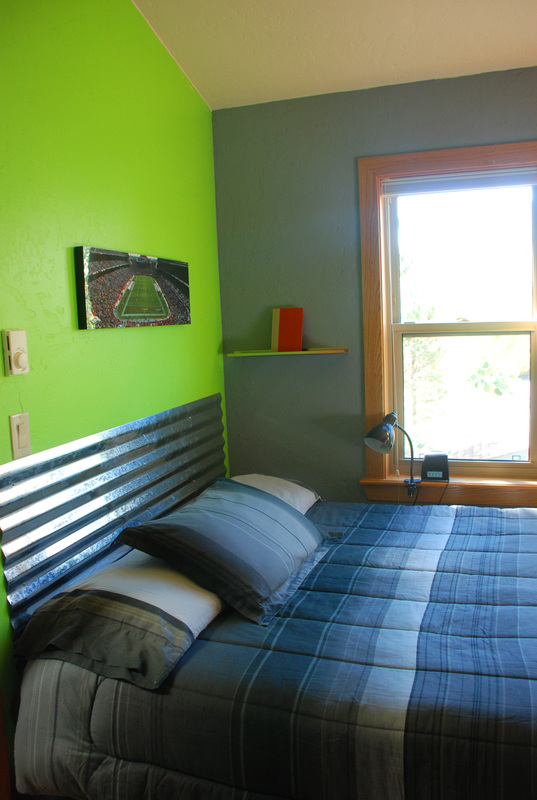 Instead of metallic walls, we added a sheet metal headboard and accents to give it an industrial feel. I found this desk at the thrift store and it is perfect for Sam. 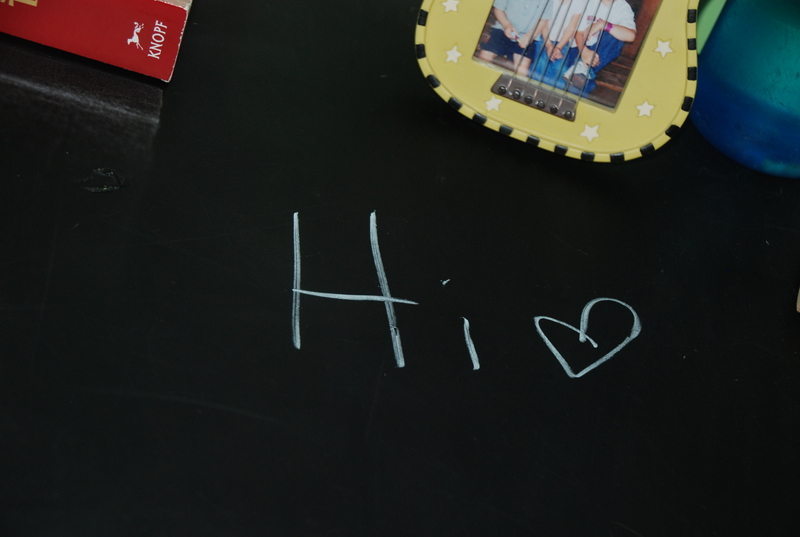 I cleaned it up a bit and put a coat of chalkboard paint on the top. It has lots of space for all his stuff and a big enough desktop for homework. Why do kids have so much “stuff”? Sam has a pretty big closet so we didn’t need space for a dresser in his room. That way we could add this fun chair into the mix. 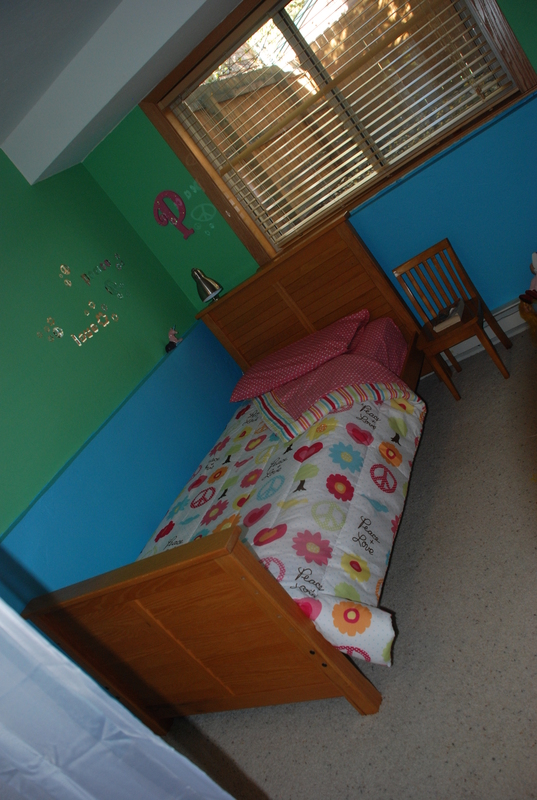 Next came the girls basement bedroom. Two words that described their room, dreary and gloomy. It was also big so it worked for both of them. They have had their paint picked out for a long time. 2 year to be exact. 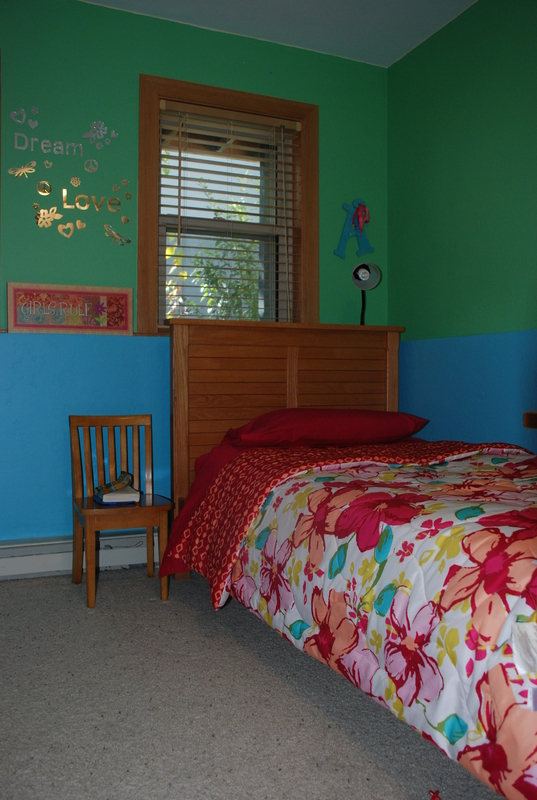 We were planning on redecorating their room in Colorado Springs but once we decided to move, painting a bedroom bright green and blue seemed like a bad idea. Finally, they got their cool big girl room. We started out with their beds bunked but realized that they both needed some of their own space so I unbunked them and separated the room into two distinct spaces. Alice’s side of the room. She got a new linens and kept her antique dresser. Paige’s side of the room. She is using the built-in dresser in the closet. This gives her more rooms for some of the toys and dolls she still loves. She also got a new bedspread that is totally her personality. No more matching quilts…. In an effort to give them each some of their own space but still keep them together, I ran some sheer curtains across the middle of the room on a wire divider. 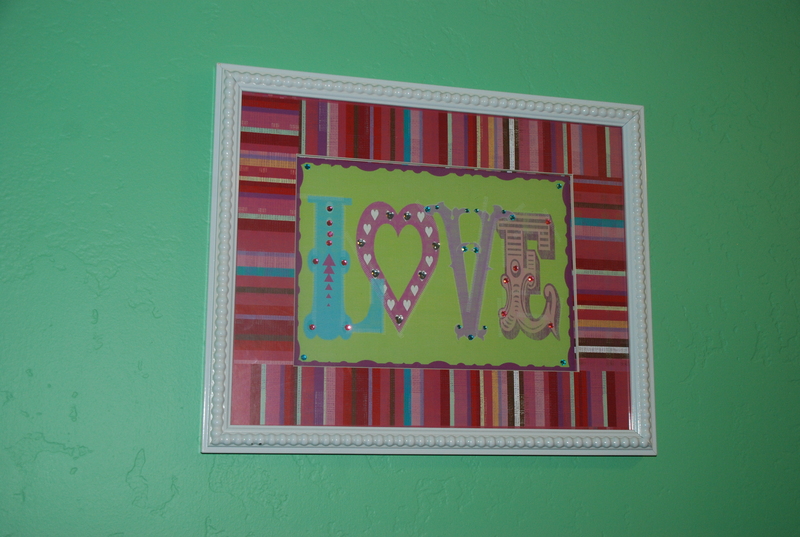 They both love this idea and couldn’t wait for me to hang it all up. The funny part is that every time I go into the room, the curtain is pushed all the way back to the wall. I guess they really do love each other. A little bit anyway:) They enjoy playing in the common space but also the tiny bit of privacy the curtains give them. This sign was the inspiration for their room. I am also having some black and white candid shots of them blown up and framed. I think it will be the perfect finishing touch for this shared room. Love each one. They have a good mommy!